Infuse your wedding-day style with unique, fashion-forward pieces. These days, there are no rules when it comes to what to wear down the aisle on your wedding day. If you’ve already devoured pages and pages of wedding magazines and Pinterest boards, the world of white dresses has probably become a blur. The runways, on the other hand, are an ever-changing source of inspiration. 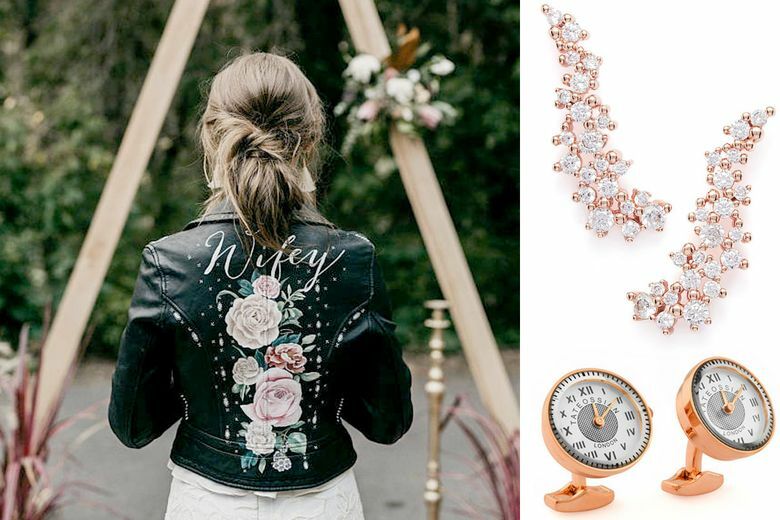 Plus, investing in trendy pieces that translate seamlessly into real life is a style-savvy approach any budget-conscience bride can get behind. 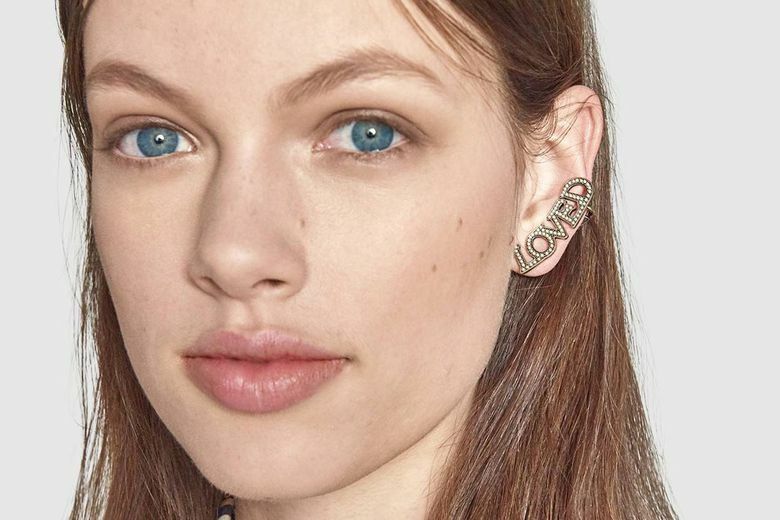 From unexpected crawler earrings to a standout pair of shoes, these luxe picks are perfect for when you want to say “I do” while still expressing your personal style. Give your wedding gown the high-fashion treatment with statement-making sequins, lace and feathers. Rime Arodaky Lenny Gown (pricing on request at The Dress Theory, Green Lake). Look both romantic and seriously cool in this long-sleeve, lace minidress with a long silk overskirt. A dramatic slit reveals the short skirt underneath, and pockets make it feel effortless. Willowby Orion Tulle & Charmeuse Plunging A-Line Gown ($1,995 at Nordstrom Wedding Suite). A wedding dress does not have to be white and poofy. 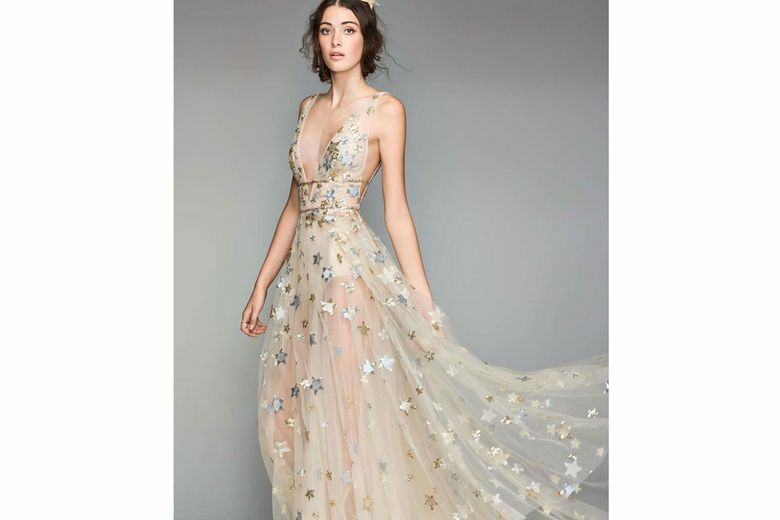 Instead, consider a show-stopper like this daring sheer gown made with a light-as-air tulle overlay embellished with celestial gold and silver sequin stars. 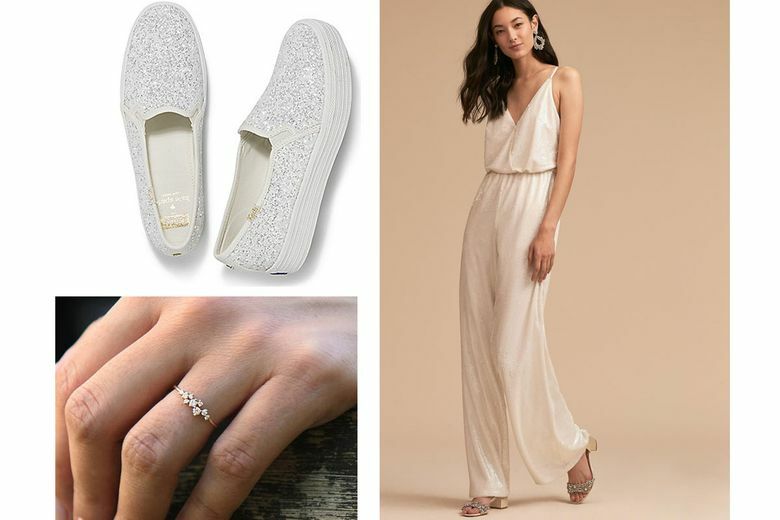 Aidan Mattox La Lune Sequin Jumpsuit ($200 at bhldn.com). Channel your inner disco diva in this sequin-covered jumpsuit that’s as glam as it is comfy. And the simple silhouette lets you play up your favorite shoes and accessories to the max. In the Pacific Northwest, outerwear should always factor into your wedding-day look. Black Salt Thalia Hand Painted Leather Jacket ($150–$350 for painting, jacket not included, at etsy.com/shop/BlackSaltHandpainted). For an edgy style, opt for a biker jacket painted with a gorgeous bridal motif by Utah artist Shannon Parrish. You can work with Parrish to customize a design, adding it to the jacket of your choice. 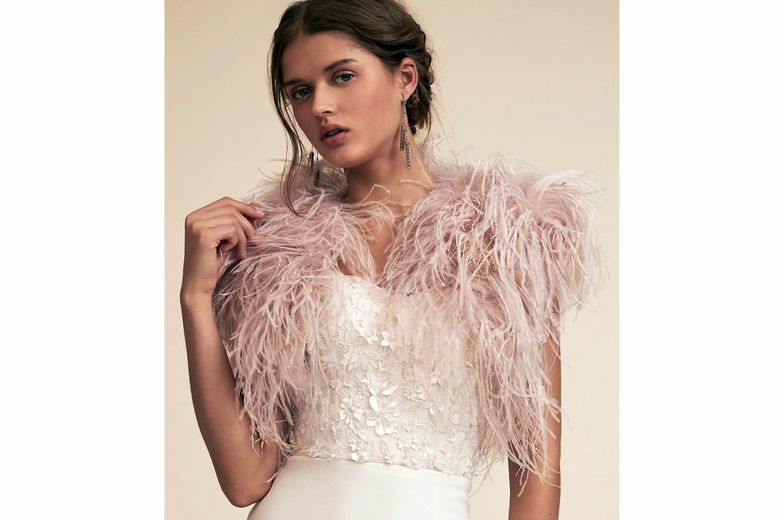 Ivy & Aster Rosemary Shrug ($300 at bhldn.com) Made from ethically sourced ostrich feathers, this flirty, vintage-inspired shrug is cropped to show off the narrowest part of your waist and adds rich texture to satiny bridal textiles. Walk to a different beat down the aisle by swapping the classic white satin pump for something you’ll wear long after the big day. Balenciaga Embellished Slingback Sandal ($1,390 at Nordstrom). Add sizzle to an asymmetrical or tea-length dress with this sequin-laden slip-on in vivid fuchsia. It will bring a refreshing burst of color to your ensemble, and will be your go-to shoe for special occasions to come. Sophia Webster Jumbo Lilico Sandal ($650 at sophiawebster.com). Adding touches of black is one of the season’s biggest bridal trends. 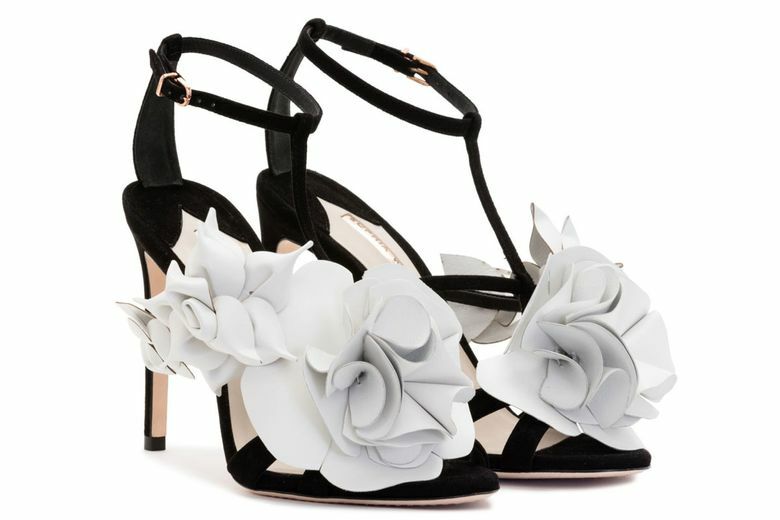 Apply it with elegance with this black suede sandal with blossoming white leather flowers. Keds x Kate Spade New York Triple Decker Glitter ($90 at keds.com). Comfort is king, and you don’t have to give that up on your wedding day. 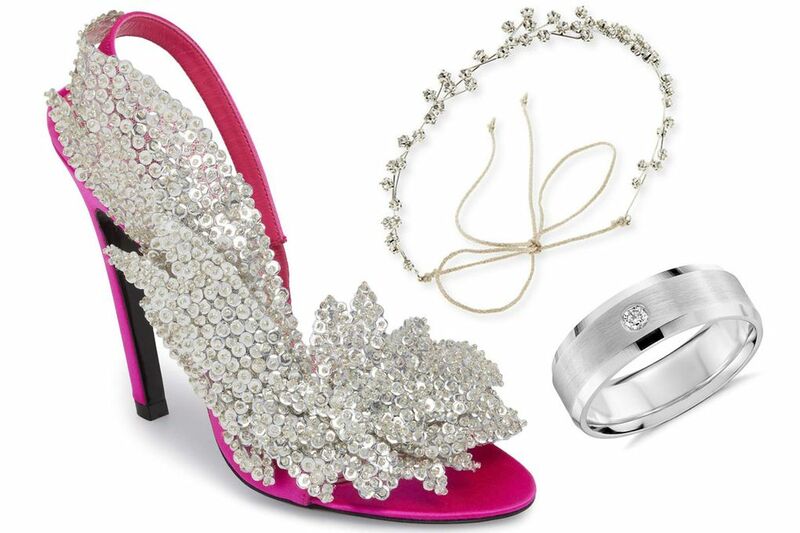 The sneaker gets the bridal treatment on this glittery shoe with a stacked sole. Pair grandma’s pearls with something on-trend or edgy to add the final touches to your personalized look. Ferko’s Diamond Cluster Ring in 14K Gold ($310 at etsy.com/shop/FerkosFineJewelry). Love dainty jewelry? Then swap the basic band for this delicate ring, handmade from 14K gold with nine tiny diamonds, that can be stacked or stand alone. Gucci Single Loved Pendant Earring with Pearls ($350 at Gucci). Create an Instagram moment with this pendant earring in antiqued gold with pearl-like insets. A clip behind the D provides stability while you dance the night away. Suzanne Kalan White Diamond Crawler Earrings ($1,400 at goop.com). For a stud with extra pop, consider these 18K white-gold stunners encrusted with bezel diamonds in a constellation shape. Kendra Scott Petunia Ear Climbers ($90 at kendrascott.com). 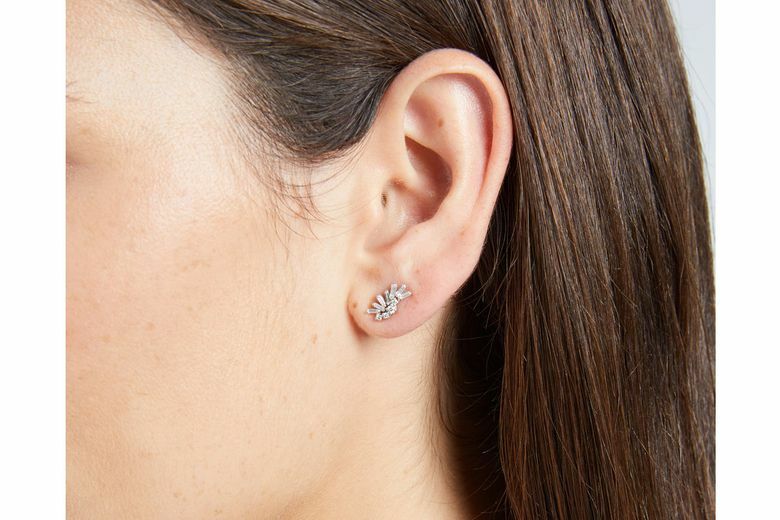 Look modern but still classically elegant in these sparkly floral clusters available in silver, gold or rose gold. Jennifer Behr Orion Crystal Circlet Headband ($575 at neimanmarcus.com). Hair jewelry is romantic and on-trend, and this headband, embellished with star-shaped Swarovski crystals, will have you shining bright. Tateossian Rose Gold-Plated Watch Cuff Links ($295 at neimanmarcus.com). These clever cuff links will remind him of the great times you’ve had together, the times to come — and that it’s time to tie the knot. Blue Nile Single Diamond Wedding Ring ($880 at bluenile.com). The single diamond in the center of this platinum wedding band adds just enough sparkle to make it stand out from the rest. 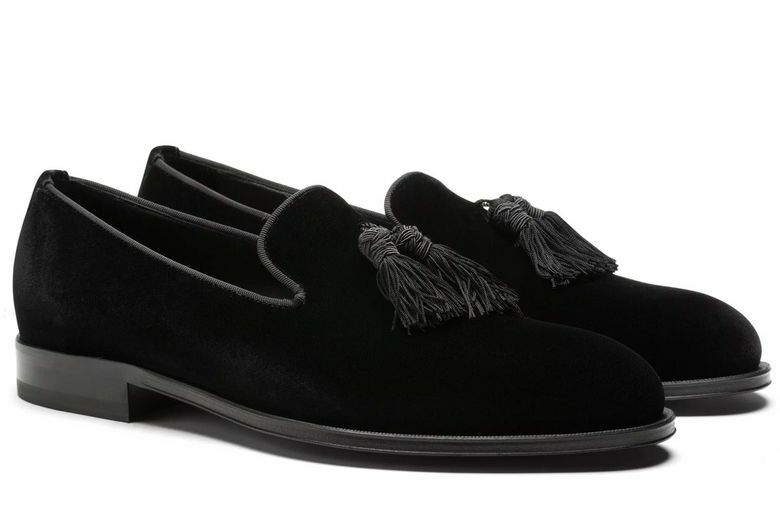 Suit Supply Black Velvet Slippers ($299 at us.suitsupply.com). More debonair than Hugh Hefner, these velvet slippers are understated, comfortable and add individual style to a classic tux or simple suit.